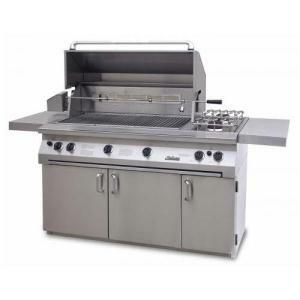 Solaire's 56-inch gas grill with ceramic InfraVection burners offers fully controlled infrared grilling, easily convertible to the more traditional convection heating of older styles. If you like new grilling options but cling to the old methods you already know, the Solaire backs you up with both systems. The main grilling surface of 667 cubic inches is backed up by a secondary warming rack of over three hundred cubic inches, powered by three main burners running at a total of 85,000 BTU's. Dual side burners run at 17,000 BTU's each, and the independently heated rotissierie section adds another 18,000 BTU's of controllable infrared heat. This variety and large working surface area provides every option you'll need. Accessories available as an additional purchase include a stainless steel wood chip smoker box, steamer/fryer system, a BBQ sauce tray to replace a portion of the cooking grid, and a large stainless steel griddle. The Solaire is like having an outdoor kitchen, far more versatile than a single purpose gas grill. Some cabinet space is devoted to storage, within a weather resistant welded steel framework. Heli-arc welded seams cut down on gaps where rain can enter and grease can collect. A vinyl grill cover is included. Check out this outdoor fireplace, too -- it's perfect for keeping your grilling buddies warm on a winter night, or roasting marshmallows with the kids.